I never really get all of the nostalgia for the 90’s. I mean, I was there, we had some fun, but people always forget all the really nasty stuff like the riots, the AIDS crisis, and whatever it was I was wearing there at the end. One thing that definitely inspires warm fuzzy feelings, however, is late 90’s internet culture, and that’s the kind of in-your-face, vaguely corporate nostalgia that Hypnospace Outlaw seeks to inspire, and it does so without missing a beat. 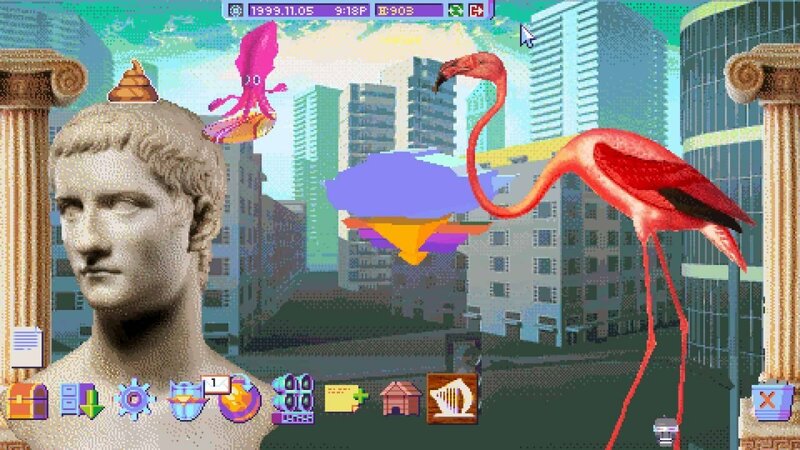 Hypnospace Outlaw imagines an alternate history where instead of surfing the vast information superhighway pre-turn of the century on bulky desktop machines with cow coloured boxes, users could do it all in their dreams through a Merchantsoft branded headband. The player is tasked with providing order to this lawless land as a Hypnospace enforcer by finding internet crime and flagging it for moderation, like a real hero. It sounds fairly easy, especially since there appear to be only five sorts of crimes one can perpetrate online, but what follows is an in-depth trawl through hideous webpages following possible leads and dead-ends. It sounds tedious, but I loved every second of it. At its heart, Hypnospace Outlaw is a mystery game, casting the player as a detective in a thoroughly fleshed out world. The game is packed with interesting storytelling moments. Nothing helps you understand a character more than his devotion to an awful band whose music blares from his litany of pages. When something terrible happens, I recognized the usernames of people affected and felt bad, even though I had never actually met a single one of them. And I’m ridiculously invested in the rise and fall of Coolpunk, a musical genre born from this digital realm. Nostalgia has turned into a marketing ploy where our joy is repackaged and sold back to us to support faceless corporate overlords, and that’s kind of what Hypnospace Outlaw is about. Behind the bad art and questionable music is a real appreciation for what it mocks. Even more uplifting is the community that loves this game and a developer who seems to want to continue supporting it with updates, additions, and Steam Workshop tools to add new missions, user-generated pages, and really bad GIFs. 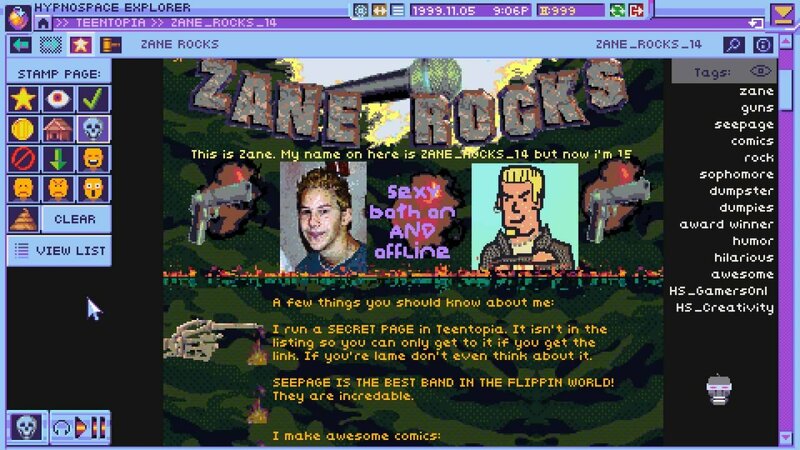 Hypnospace Outlaw’s 90’s tinted internet exploration is spot on, but may be too specific for players who were not around to experience that particular time.